Steven Spielberg has always had a knack for taking movies somewhere you might not expect them to go. Even if I had no interest in the material, but knew it was directed by Spielberg, I would be interested in seeing it. He carries that weight that if he finds it interesting enough to make then it is probably worth seeing. Such is true with both of his big releases this Christmas season. Before hearing of he and Peter Jackson's collaboration on a film adaptation of the comic book series I had never heard of Tintin or Herge. Still, the motion capture looked flawless and this coming from a guy who doesn't usually enjoy the medium. I just can't watch "The Polar Express" and I didn't even bother with "Beowulf". Instantly though there is something more to Spielberg's adventure flick that can easily be seen as an updated, more child friendly Indiana Jones. Most would say this is the Indiana Jones movie Spielberg should have made a few years ago even. That wouldn't bother me as I very much enjoyed "The Adventures of Tintin" despite the legendary director not doing as much with his first 3D opportunity as Scorsese did last month and it getting off to a rather slow start. No, it wouldn't bother me at all because once we moved past the exposition in the beginning and dove into the thick of the plot (meaning once Captain Haddock was introduced) the movie took a turn for the best and I was strapped in for the adventure and excited to take it. 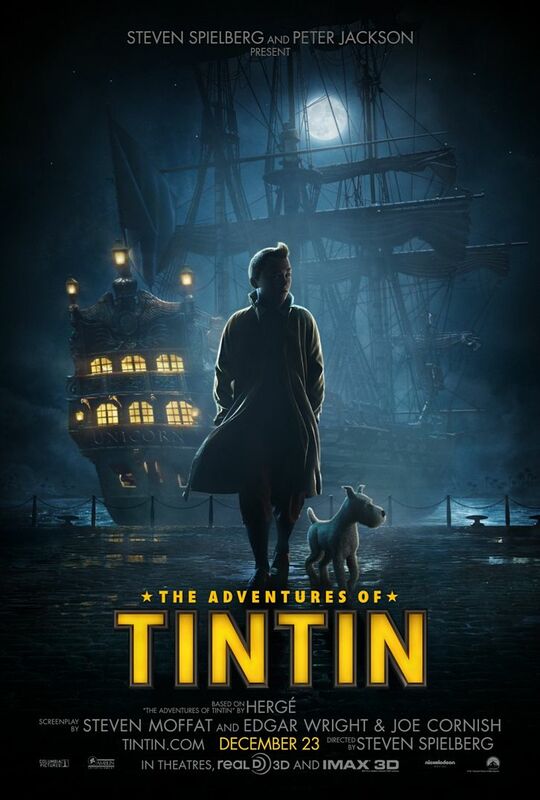 pay Tintin (Jamie Bell) a visit. Apparently what Spielberg and Jackson have done is to combine three of the stories from the comic strips; The Crab with the Golden Claws, The Secret of the Unicorn, and Red Rackham's Treasure. Now, I have no idea whether these stories overlapped in the original comic strips or not, but if they didn't the top notch writing team here including Steven Moffat (Doctor Who) and director Edgar Wright (Shaun of the Dead, Hot Fuzz, Scott Pilgrim) and his long time collaborator Joe Cornish have done a fine job of connecting them and making them feel like a coherent piece. Despite how the circumstances may have come together and how the characters met one another in those stories what is important here is what happens in the feature. We begin this story with a wonderfully classic Spielberg sequence of a pick pocket as he roams the streets of a flea market that eventually leads to the reveal of our title character. Never has Spielberg seemed to feel so free with his camera as he does here. The technique of motion capture allows him to weave in and out of situations and set pieces that otherwise might seem impossible or could take days to complete successfully. Spielberg has always been a man of great camera work, but here his intuition really shines as he is able to do that initial instinct of a shot and have it come out just as he saw it in his mind. The pick pocket plays into the story only in a minor way, but it plays a part as you might imagine and so does what our hero decides to purchase at this flea market. Watching it you can almost feel the excitement with which Spielberg is operating and it translates from the screen into the wild imagination of the children experiencing it. Sakharine (Daniel Craig) gets ugly with one of his goons. When our young reporter and his little dog Snowy come across a three-masted sailing ship for cheap it is impossible to resist but immediately after acquiring the ship he is approached by a mysterious figure and then Mr. Sakharine (Daniel Craig) who try desperately to take the ship from him. 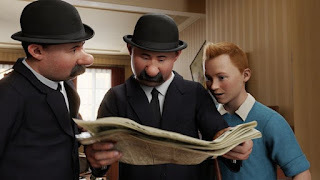 It is obvious there is something about this model that is of value to the two men and Tintin isn't one to let a mystery, or an adventure not go investigated. He takes the model home and when it is broken by Snowy and the neighbors cat we see a parchment scroll fall from the center mast with Tintin unaware of it he is sidetracked by Thompson and Thompson, two bumbling detectives voiced by Simon Pegg and Nick Frost, who are on the trail of our pick pocket from the opening sequence. The layers overlap and form a larger, grander story than expected when Tintin is abducted by Sakharine's men and brought aboard a ship; a ship that is supposed to be under the command of a Captain Haddock. Haddock holds the key to the secret of the unicorn (the name of the model ship) that Sakharine is extremely invested in finding for ancestral reasons that we won't go into detail about here. 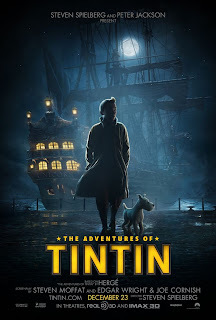 The movie moves from one big set piece to the next as Tintin escapes his confinement on the ship, teams with Haddock (Andy Serkis, elevating the experience of a movie with his performance for the second time this year) and escape only to piece together why Sakharine needs Haddock alive and what it is he is after. The adventure is too much fun and is held together by enough mystery that I won't go into any more detail here. It won't really matter to the target audience though as the theater I was in contained enough parents and their children to make me realize that both were having a wonderful time exploring a world that while breathtaking to look at also offers plenty of nostalgia and strong story for the adults while supplying engaging characters that the kids will pretend to be in the front yard the next day. to solve the mystery of Haddock's ancestors. For knowing nothing about the origins of the character and having nothing invested in the source material, this film still seemed to come off as something special. It is a hearken back to the days of old where you watched something on screen and immediately wanted to be that main character. It is a movie that genuinely attempts to bring out the kid in you and for the most part succeeds. It made me feel like a kid again, an excitement in the adventure that moved past the screen and into my imagination. This is where Spielberg has shined for decades and in many ways has become his specialty. He guides the action through their grind with sparks of imagination that never seem to dry up. He gives us a pair to invest in and seems to desire nothing more than to do justice to the comic books that he fell in love with so many years ago. He is the director that was perfectly chosen for a movie like this, one that seems to have capture the tone of what the comic books were. 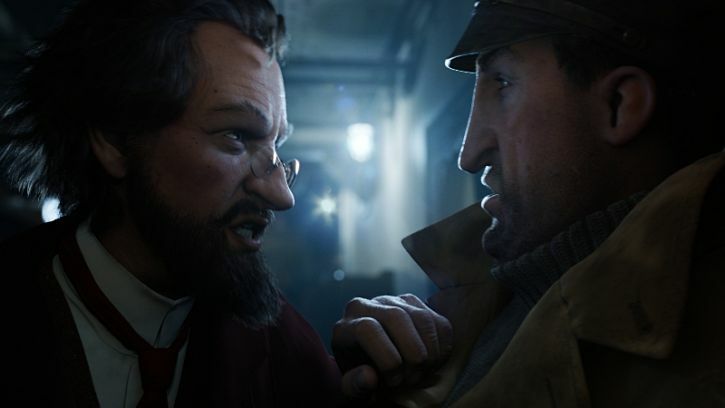 Though I have to admit I was worried at first, both with this being motion capture animation and the fact I was not immediately engaged and waited a good fifteen minutes or so before beginning to settle in. Really, that is the biggest accomplishment in my eyes. That these characters feel real, that they seem to have a life in their eyes and a seamlessness to their movement. It is something I couldn't move past with the other films made with this technique. It was a distraction from the story those movies were telling. 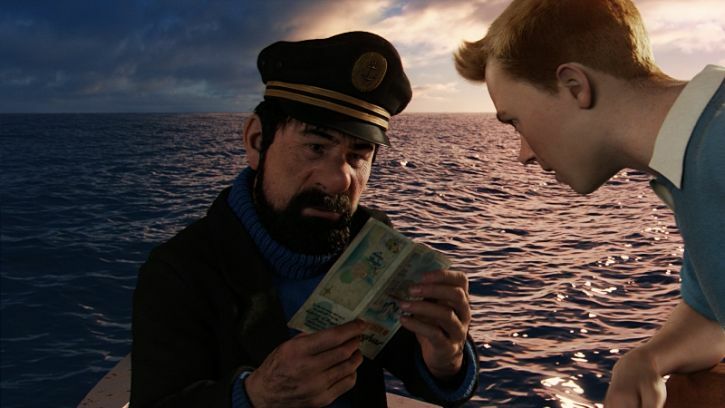 With Tintin though, I was completely absorbed by the film once Captain Haddock came into play and I couldn't be more excited to go on another adventure with he and Mr. Tintin next time they come around.